Astrology is an applied science based on hypothetical data and an extraordinary invention by mankind which answers many questions which is unanswered by any science. It is a world of Stars, Planets, their positions and impact of them in any living or material things on this universe. When a person is born, destiny of the life is decided. Native’s life, Luck, Characters, features, everything is written based on birth time and the planetary positions on that time. Astrology is an ancient old tool which helps a person to discover him/herself. It helps to plan for the future according to the birth time and current transits. . Being an Astrologer the most asked question in common person is what is Astrology? Even though there are some general awareness about sunsign, moon sign etc, it is not very likely that the answer of what is astrology is known. What is Astrology : What is Indian Astrology ? Next question asked after what is astrology is what is Indian astrology. Indian astrology is known as Vedic astrology or Jyotish or Jyotisha. Indian astrology origin is Hindu Vedas. Practice relies primarily on the sidereal zodiac, which is different from the tropical zodiac used in Western astrology in that an ayanamsa adjustment is made for the gradual precession of the vernal equinox. In Sidereal astrology, the zodiac is aligned with 27 constellations (each of them are named with a star or Nakshatra). Aries, the first sign of the zodiac, aligns with the first star named Aswini. In the tropical zodiac, the point in space when the Sun crosses the earth’s equator is the beginning point of the zodiac, or Aries. There is another main difference in Indian astrology compared to Western astrology is the calculations of planetary positions. Indian zodiac is Sidereal where as Western zodiac is Tropical. Indian Astrology Planetary positions are based on Lahiri Ayanamsa. 12 Signs Entire Eclipse on the sky is divided into 12 Signs, represents a fixed place on the sky. Hence, every signs are spanned through 30 degree of space on the sky. Signs are named in sequence as Aries (Mesh), Taurus (Vrish), Gemini (Mithun), Cancer (Karkat), Leo (Simha), Virgo (Kanya), Libra (Tula), Scorpio (Vrischik), Sagittarius (Dhanu), Capricorn (Makara), Aquarius (Kumbha) and Pisces (Meen). Key point to be noted is, for a person the position of Moon during birth is called Moon Sign (Rashi used in Indian Astrology) and position of Sun as (Sun Sign used in Western Astrology). What is Astrology : What is Ruling Planets in Astrology ? Each planet is having friend and enemy planats, and a planet is stronger if located in a friend's house or in conjunction with or aspected by a friend planet. Same way a planet is weak if placed in enemy's house in the horoscope or in conjunction, opposition or aspected by an enemy planet. 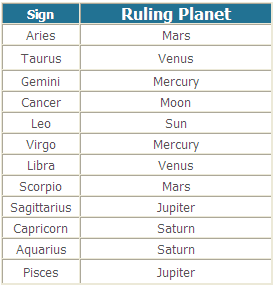 Relation ship between the planets are as following. What is Astrology : What is 12 Houses in Astrology ? The whole life of the native is contained in twelve houses called behaves of birth chart. Ascendant in the birth chart being the first house and rest of the houses are counted anti-clock wise. For every native, due to different Ascendant sign, all houses are different. What is Astrology : What is Ascendant in Astrology ? From the birth time and the birth location, Indian astrology determines the 1st house in the birth chart. Rests of the houses are counted anti-clock wise. 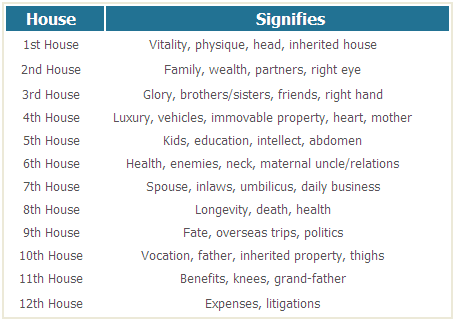 For example, if Pieces be the first house for a person then the second house will be Aries. 1st House, First House, known as the Lagna or Ascendant, is mainly responsible for an individual’s physique, shape, and color. 1st House, First House deals with the general health conditions of an individual. 1st House, First House determines the mental capacity, temperament, character, behavior, good luck and bad luck of the individual. This house also tells how much fame, honor, property, status and comfort a person will gain during his life. .
What is Astrology : What is Horoscope ? The next commonly asked question after what is astrology is what is horoscope. Horoscope or birth chart or janam kundali contains the detail information of the positions of planets, stars at the birth time for a person. Each planet and star positioned on zodiac sign according to the time. Placement or planetary combinations are used as input for an astrologer to predict about the native’s life and future. Monnastro brings Free Astrology Horoscope prediction to you with detail report and recommendation which can be act as a guide for the Indian Astrologers from making human mistakes. What is Astrology : What is 27 Stars in Astrology ? There are 27 Nakshatra(Star) in Indian astrology. The ecliptic of 360 degree is divided by 27 stars equally, so each of the Nakshatra(Star) has 360/27 = 13.33 Degree space. In the birth chart or Horoscope, every Nakshatra(Star) own 13.33 degree. If a planet's position in birth time (as in birth chart) is on the space own by the star is the Star of the Planet. Indian Astrology is Moon based astrology. Nakshatra(Star) of a person is determined by the Moon position in horoscope owned by the star. For example if Moon is in 209 Degree in Horoscope the Moon Sign is Libra and Birth Star is Vishaka. To know your birth Star please generate free horoscope. What is Astrology : What is Transits in Astrology ? Astrology results are all based on the planetary positions in a sign and their relative positions. Any event that changes the positions or relation between two planets are important in astrology and called transit. Transits are the key input in astrology for any day to day or monthly or yearly forecast which can be somewhat applier in a generic fashion. For example, if Sun and Moon are at an angle of 90 degree (called square between two) in a day that is considered as an important transit event. What is Astrology : What is Aspects in Astrology ? Aspects are caused by geometric position difference of two planets. Western astrology considers sxtiles, trine, square, opposition, conjunction between two planets, but in Indian astrology Aspect means different thing. Every planet aspects on the planet that is positioned in the 7th house. Jupiter, Mars and Saturn has some additional aspect positions with 7th house. Mars cast aspect on 4, 7, 8th house from its natal position in Birth chart. Jupiter cast impact on 5, 7, 9th house from its original position in birth chart. Saturn cast aspect on 3, 7 and 10th house. For example, if Saturn is placed in Pieces then it aspects in the 10th House from it in Sagittarius. If any planet say Mars is positioned in Sagittarius then Mars is said to be aspected by Saturn at that time.